Fri., April 7, 2017, 8:04 p.m.
Marshawn Lynch is a man on a mission. He’s determined to make news while doing nothing worthy of making news. Some celebrities – Paris Hilton, Kim Kardashian, Jerry Jones – are adept at this, but they’re not in Lynch’s league. Beast Mode regards the task of remaining relevant in irrelevance as a full-time job. Long before speculation arose about the possibility he’ll un-retire from the retirement he never officially announced, Lynch proved to be a master of getting people to talk about him. Participating in the Seahawks’ visit to the White House after their Super Bowl victory, for instance, presented Lynch the chance to join his fellow players for a team photo with the president. It was a once-in-a-lifetime opportunity, but standing in a photo with the leader of the free world did not qualify as a story. Staying home, pretending to be oblivious about the White House trip, well, that was a story. It made news. 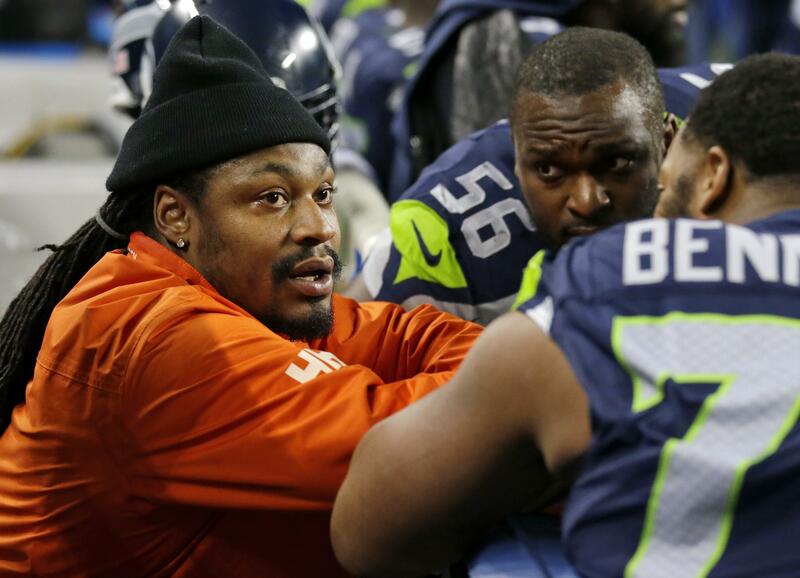 Lynch’s problem is that for somebody with plenty of time on his hands, the clock is ticking. He turns 32 in a few weeks, young in real life but very old for an NFL running back reported to be interested in un-retiring from a sort-of retirement. Lynch can use the ruse only so long. The day will come when making an appearance at Oakland Raiders headquarters, as Lynch did this week, is not interpreted as significant. Until then, Lynch must squeeze the most out of every hour, finding different ways for fans to wonder what’s going on in his life. “I’m done, I’m done,” he said last year during a “60 Minutes Sports” interview that aired on Showtime. “I enjoyed my time, now it’s time for my cousins to do their thing. Speaking with Seattle’s KIRO radio on Wednesday, Seahawks general manager John Schneider, whose team controls Lynch’s contract, provided an update on Lynch’s plans. No, that would not be it. Lynch treasures his role as star of a one-man soap opera, and the typical soap opera has the life span of a tortoise. If Lynch is pondering a career revival with the Raiders, his motives are unclear. Football never has been more than a lucrative occupation for a terrific talent who admits that he doesn’t follow the sport. The Raiders’ fluid franchise situation further clouds the picture. Lynch loves Oakland, but the team’s imminent relocation to Las Vegas is seen by Oakland city executives as the ultimate insult. Lynch is a savvy businessman who survived the NFL with his brain intact. He carried the ball 2,337 times, usually initiating the kind of collision that would send the rest of us to the emergency room. Why would he be tempted, two years removed from an ineffective, injury-riddled season with the Seahawks, to submit his body to more abuse? My guess is this: He gets the chance to semi-retire again. The first semi-retirement retirement was a social media phenomenon. Midway through the fourth quarter of Super Bowl 50, he posted a Twitter photo of a pair of football cleats hanging on a wire. The photo was an imaginative method of telling the world he was calling it quits. Except without any words, he left the door open. Lynch sent his message out on Feb. 7, 2016, at 6:46 p.m. PST. As of 6:46 Friday afternoon, 10,200 hours will have passed with Beast Mode’s football future in flux. He has savored every minute of those 10,200 hours. “Which camera do you want me to look at?” Lynch asked during his television-studio interview last year, when he insisted he was retired. Lynch has a quirky sense of humor — he’s got some stand-up comedy potential — but his apparent confusion about the camera was contrived. It didn’t matter which camera he looked into as he spoke. What mattered is that he was in front of a camera. Published: April 7, 2017, 8:04 p.m.